Welcome to AIDS-ART.com feature on the work of Carl Tandatnick. Tandatnick is both an artist and a physician (Anesthesiologist). His two fields intertwine to yield work that speaks from a special niche addressing issues of mortality and contemporaiy technology. In the over-90, large scale, photosilkscreen-on-canvas paintings, he has produced the images of the AIDS virus and red and white blood cells magnified thousands of times by the electron microscope. Tandatnick says "As art approaches the twenty first century, our interaction with science will shape and expand our visual horizons. As a world of new images is revealed, our responsibility as artists of the 21st century is to draw upon them and make them available to a wider audience through our art." Being a physician, the fragile nature of life is is always foremost in his mind. Through the mediums of painting, video, and installation, he deals with issues such as the AIDS epidemic and medical crisis. The work is serious in content and presents an aesthetic which is at the same time seductively beautiful. Tandatnick has shown extensively in museums and galleries in the United States and internationally. He has presented work at such prominent venues as the SONY Trinitron in Times' Square. His work is represented in various collections including the permant collection of 20th centuiy art of the National Gallery of Australia and the Museum of Fine Arts, St. Petersburg, Florida USA. In this feature you will be able to explore Tandatnick's work by clicking through the various icons. 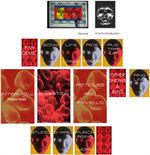 Each icon contains extensive text and visual information regarding his previous exhibitions, press, and additional information of interest. Video clips of the installations will soon also be present. A select sample of some of his paintings is contained in the Exhibition section. These paintings may be expanded to full screen for more in depth consideration. Additionally, there is an interview, a tour of the artist's studio, and an opportunity to give your comments via E-Mail. Finally there is information in regard to acquiring work by Carl Tandatnick. We hope you find this inaugural AIDS-ART.com feature on the work of Carl Tandatnick to be of interest.